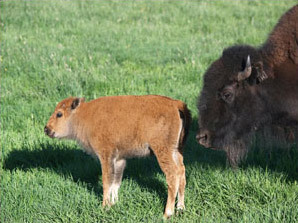 Please Note: We are now semi-retired and are scaling back our Bison Ranch and Bison Meat Business. We will only be harvesting bison about twice a year and most meat will be sold on a pre-ordered basis. Contact us with your meat requests and we will try to supply you with these meat cuts based on availability. We are no longer selling meat packages. We have a very limited supply of sides and quarters available for 2018 and 2019. Buffalo Horn Ranch Natural Meats are available directly from the ranch. Call ahead to preorder and make sure that we are around. We do free home deliveries on orders of $150 or more to Calgary and Cochrane when we have meat available. There is a $20 delivery charge for orders under $150. Feel free to order by phone, 403-556-2567 or e-mail us at peter@buffalohornranch.ca. Please leave your order along with address and phone number. If you are new to our home delivery program, this is how it works. With a minimum $150 order, delivery is free to Calgary or Cochrane. Smaller orders may be subject to a $20 delivery charge. You can order anytime by phone or e-mail and we will fit you into the next delivery. Please remember to include your address and phone number with your order. We need to receive your order at least 2 days in advance of the delivery date. Once we have all the orders, we will arrange our delivery route. We will contact you by phone or e-mail with the price and an estimated delivery time. What if I can't be home? If you cannot be home for the delivery, many customers leave us a picnic cooler with the cheque inside and we leave your order there. Typically we start our deliveries in the morning in Cochrane and then proceed to Bearspaw, NW Calgary and then work our way south. Payment can be made by Cash, Cheque or if you would like to prepay in advance of the delivery, by Interac e-Transfer via your internet banking. Sorry no Visa, Mastercard or Debit accepted. Keep informed. If you do not already receive our e-Newsletter, email us and ask to be added to our list to receive information on our Home Delivery Dates and our Summer Pick Up Information as well as other information of interest. We have retired from selling at Farmer’s Markets as of September 2015.